Falling Apart. 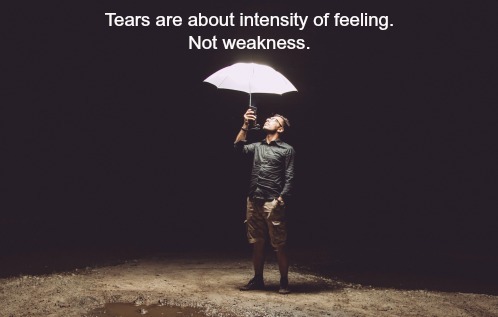 Is It Good To Cry, or Is It Weak? Sometimes you know you married the right guy. I was in the middle of infertility treatment. It wasn’t going well, and another IUI had resulted in making appointments for the next one. The battle with my reluctant body continued. We were living in Dallas. Our home had a long hall from the living room to the back den, with bedrooms off to the side. So almost from the time you entered the house, you could see clear through — front to back. I was sitting in that den, emotionally exhausted and hormonally a mess. To soothe my aching heart, I had purchased a humongous bag of Ruffles. My hands were covered in grease and salt as I plunged them into the bag, over and over. By the time my husband was coming home and down said hall, I was holding it upside down, shaking it, while not-so-carefully trying to guide the last little shards of chip into my open mouth. He stopped at the door frame. Looked at the now empty bag, then at me. Back at the bag, and then at me. He said the perfect thing. I, of course, burst into tears. Not only did his kind acceptance of where I was mean the world to me, but there was no shaming of my behavior. No, “When the going gets tough, the tough get going,” “Count your blessings,” or,“You can’t cry over spilled milk.” I was very sad. I felt helpless and hopeless, as did he. But I was the one full of Clomid and Pergonal. 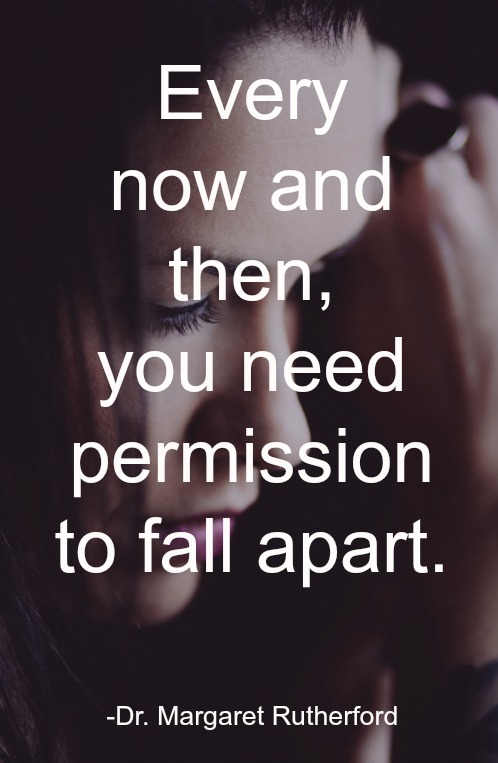 Every now and then, you need permission to fall apart. Do we all know people who tend to cry a lot? Probably. Those folks may be clinically depressed and need treatment, or they may have developed a temperament that is more sensitive. They cry easily and often, sometimes hating that about themselves. They feel overly vulnerable, or may have been teased about their frequent show of emotion. Other people never cry. There could be many reasons. Maybe they have deadened themselves to their feelings, due to abuse from their past. Maybe they have little to no empathy, avoid emotion of any kind, and live a carefully calculated life, as in sociopathy. Maybe they live their life much more engaged in mental activity than in emotional, as in Asperger’s. There are also gender-specific problems associated with tears. As children, boys who cry are often bullied — girls told that it makes them “unattractive.” Both genders can be forced into a stereotype that can become an entrenched habit. Like the tear you feel at the back of your eyes when you think of a beloved relative who has died. Or when you hear that another school shooting has occurred. When you get the phone call that the baby has safely arrived. Or when the doctor gives your best friend the news that they’re in remission. These tears are about honoring the significance and meaning of something. So sometimes, when you look back and have compassion for the child you were, there are tears waiting for you. Because you are, and were, important. You can connect with that feeling. It doesn’t have to have the power to overwhelm you. You can step into it, and then step out. But you can learn the skill, to soothe yourself, and slowly become accustomed to acknowledging and connecting with all of who you are. I fell apart that day, at least for the afternoon. I needed to. I needed to have compassion for myself. I counted my blessings, got my toughness going again, and started pouring another glass of that milk. Maybe this was the time it wouldn’t spill. Thanks for reading and please share! If you would like my posts sent directly to you each week, please SUBSCRIBE! You’ll also receive a free copy of my eBook, “Seven Commandments of Good Therapy,” a basic guide to evaluating a potential therapist or your current therapy.